A few of you have been asking for a tutorial for the dress that I made a year ago, for Caroline Macavity. Keeping up with the Christmas spirit, I have made a Christmassy themed one in the same style as Caroline’s one. It is very easy and what I think quick as well, so, here it is! First of all, create a template to fit your figure. 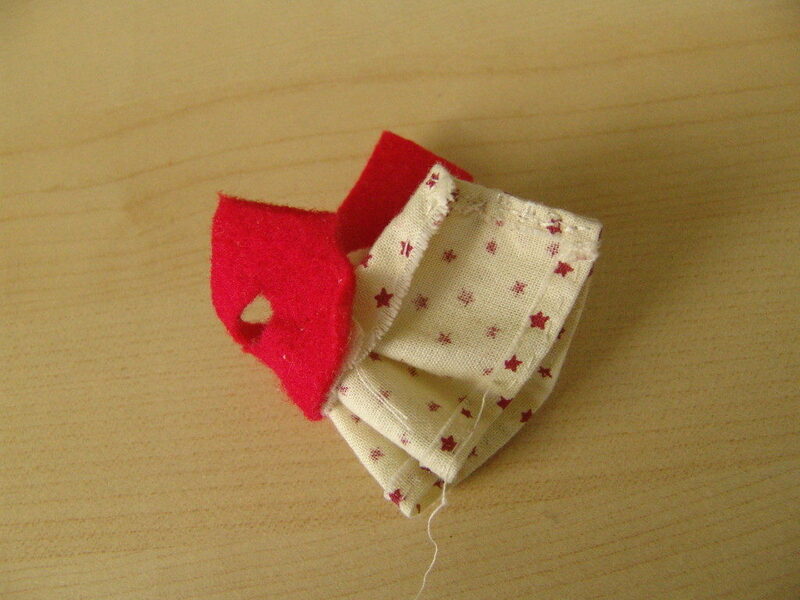 Make sure to leave a hole for the tail or otherwise your dress back will look a bit strange. 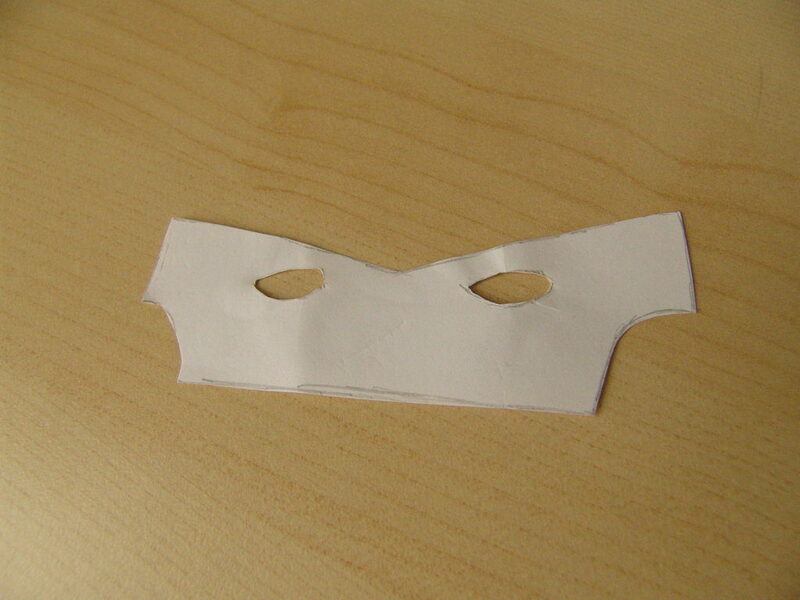 Cut a piece of felt out according to your template. Cut out a piece of fabric which is 18 cm long (this dress is for an adult) and 5 cm wide. 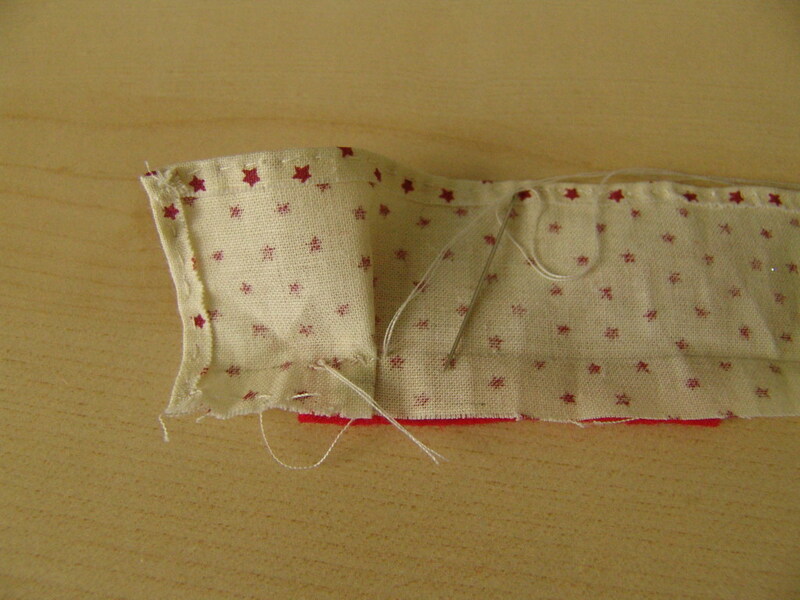 Sew over the edges so that they don’t fray. You only need to do the bottom and sides, the top can stay how it is. Rule a line 1cm from the top of your fabric. 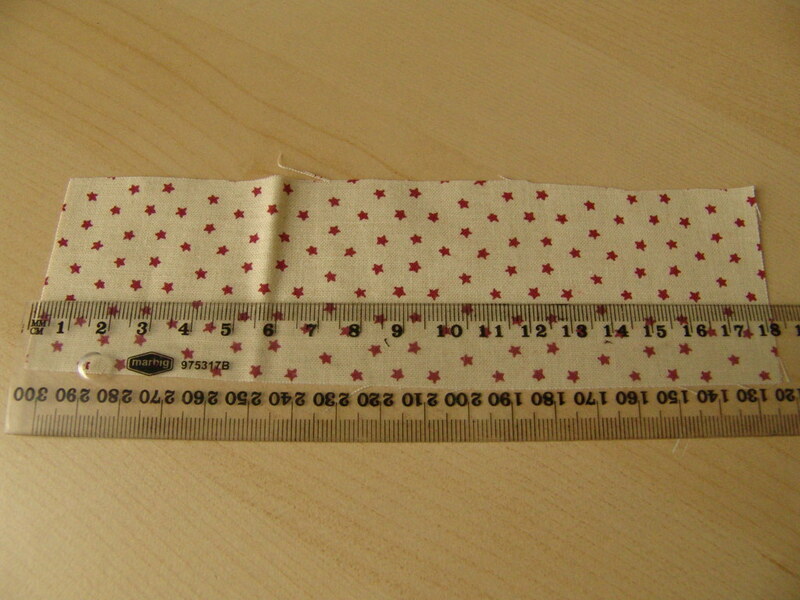 This will guide you as you sew so that your bottom bit is not wonky. 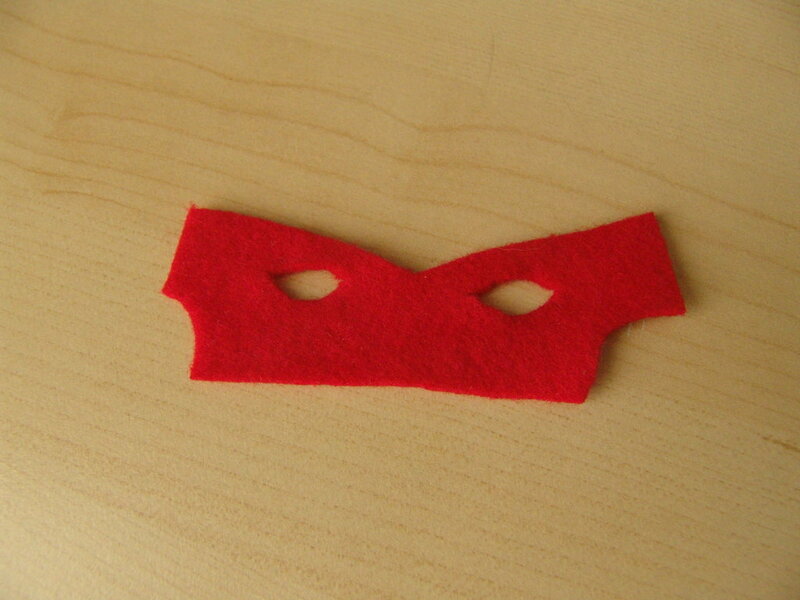 Line up the fabric with the bottom of your felt. Leaving about 2cm overhanging, sew along that line that you ruled. 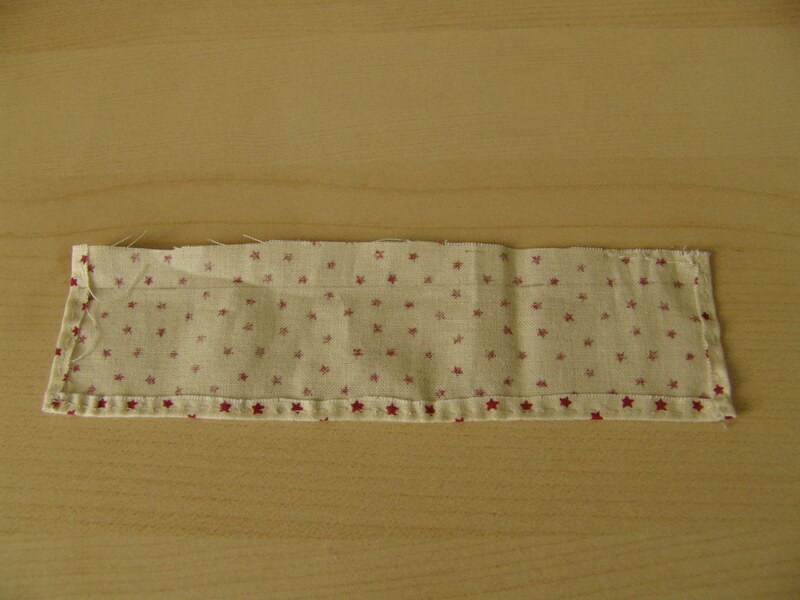 Create pleats every now and again but leave another 2cm hanging over on the other side. 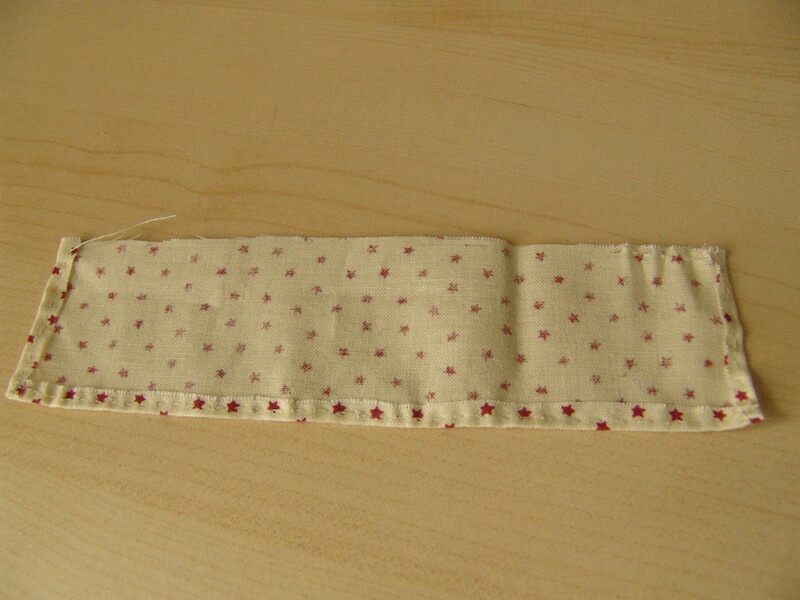 Next sew the edge of the overhanging fabric together. Just where they meet, not the top edge. This is because that fabric can be used to decrease the size of the tail hole so that this outfit will look good on both rabbit and kitty! You can add some lace and ribbons now if you want. I personally think that it looks a whole lot nicer with them but you don’t have to. 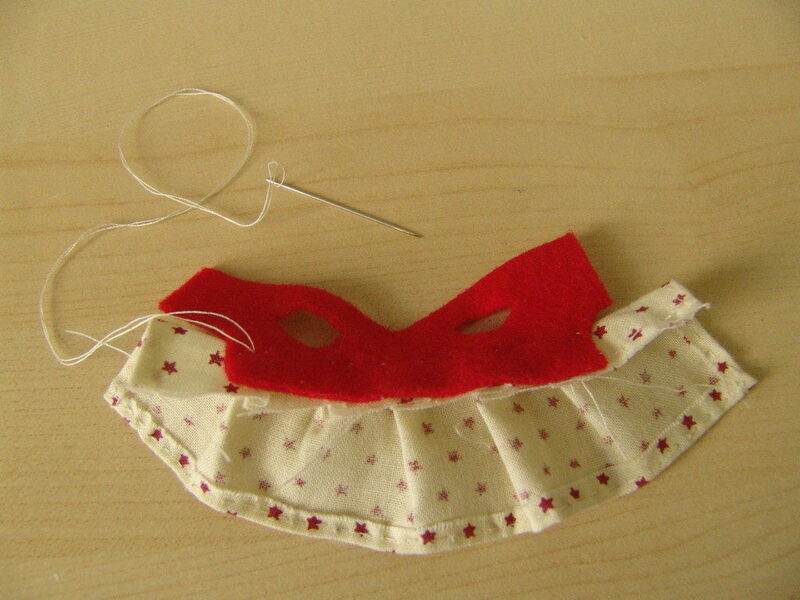 Add the snap fastener at the back to help the dress stay closed. 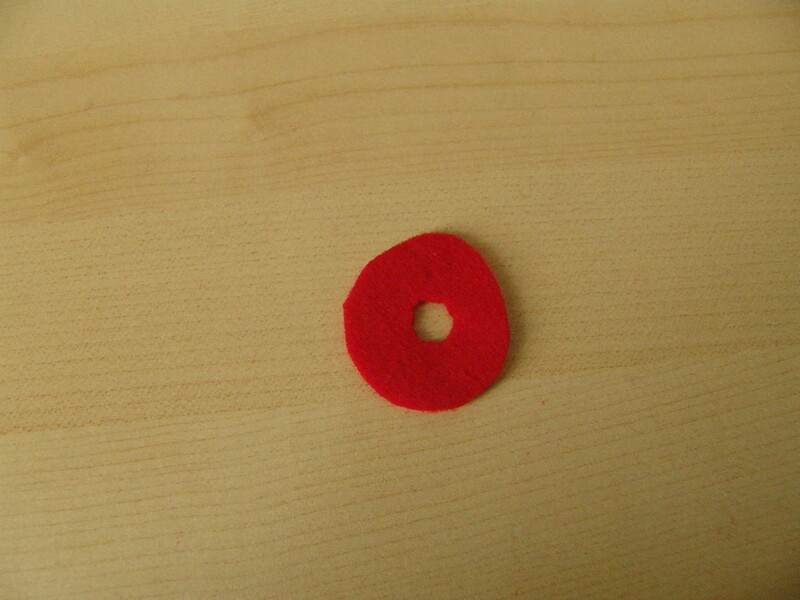 As for the hat, cut out a circular piece of felt and put a hole in it. 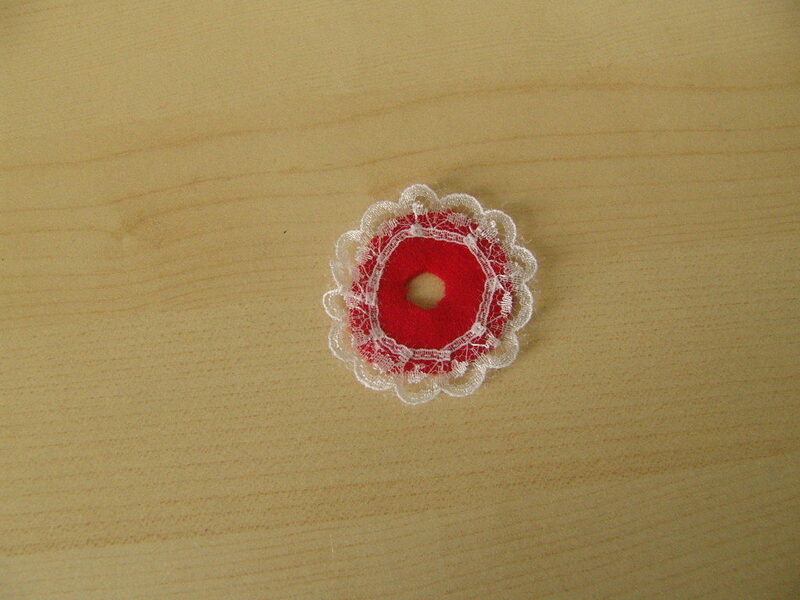 Sew lace around it and your outfit is complete! This is what the finished outfit looks like. I personally really like this dress as it looks nice and festive, the bow really does improve the overall appearance in my opinion. Hi everyone, I hope that you are all well and cheerful at this time of the year! So, if you don’t here from me until after Christmas, Merry Christmas to everyone, everyone’s critters and everyone’s families! What a fantastic tutorial, Emily ! The dress looks lovely and easy enough to make. I appreciate that the top part is made out of felt which I find much easier to handle and the best of all is that there´s no need to sew as it doesn´t fray on the neck and sleves.. The lace, the ribbon and the hat make this outfit look very elegant. I love the choice of pattern you used for this one. It looks very festive and Christmassy. 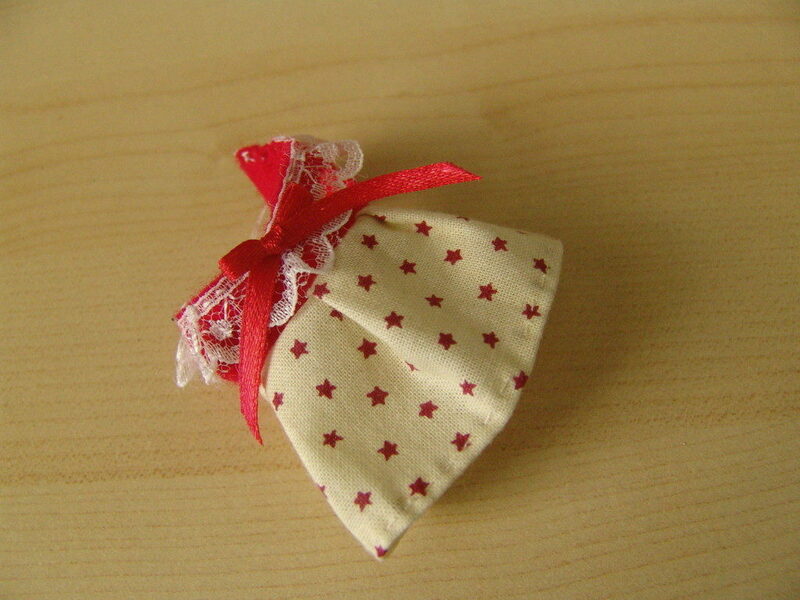 I ´ll definetely attempt to make a dress like yours. Thank you very much for this tutorial! You’re welcome for the tutorial! 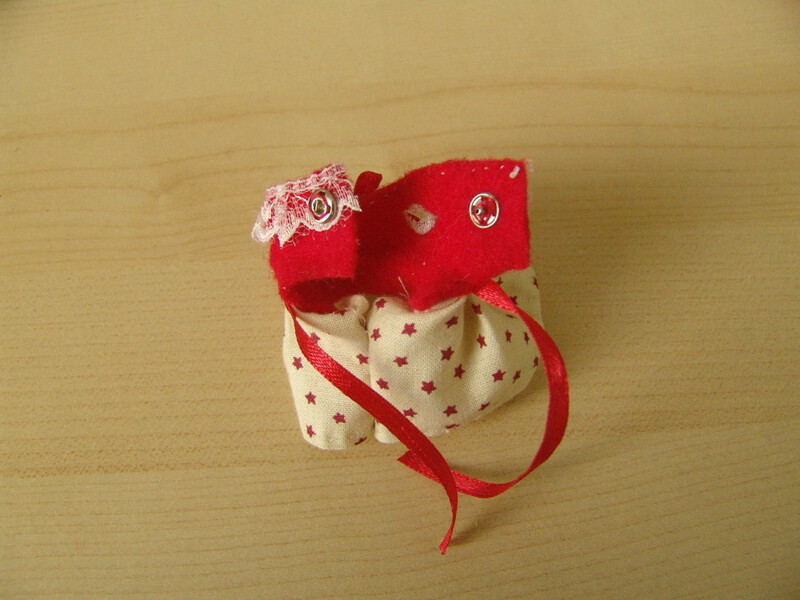 I like using felt too as it doesn’t fray and you don’t have to sew it over because of it. (I get impatient when I have to fold over and sew as for me it feels like I am not really progressing on the dress if you get what I mean) I think Sorrel will proudly be wearing her dress tomorrow! I have had the star pattern quite a while now, I think that I bought it in March this year to save for Christmas. If you do attempt to make this style of dress, I would love to see some photos! Bye for now and Merry Christmas Cutata! Awesome tutorial! The dress turns out so great! Thank you for this easy to follow tutorial! I can’t begin to explain how much I love the dress you have created… The choices of fabric are great and I agree with you – the lace and ribbon make it look extra beautiful and festive. The hat looks very cute on your rabbit also. Some of the ladies in Riverside have seen your post and their eyes almost popped out of their sockets… Although they love their woollen dresses they would love to have such elegant dresses for springtime. Lovely dress Emily! I was surprised by the felt top, but it looks so nice in Christmas dress 🙂 Excellent, that you had energy to make a tutorial for the dress! I sew clothes too, but I feel tutorials are hard to make. Thank you! I really liked using felt in this dress as it looks good and it doesn’t fray. For me, I sort of like making tutorials as I will know how to do something later on if I wanted to re create something and I can’t remember how I did it in the first place. However, some things I find are really hard to explain and it is really annoying when that happens because you know what you did but can’t put it into words. Happy New Year! Oh my gosh- this is super cute! Thanks Sarah! I love my dress too! So adorable! Thank you for sharing your excellent instructions. Thank you Melissa! 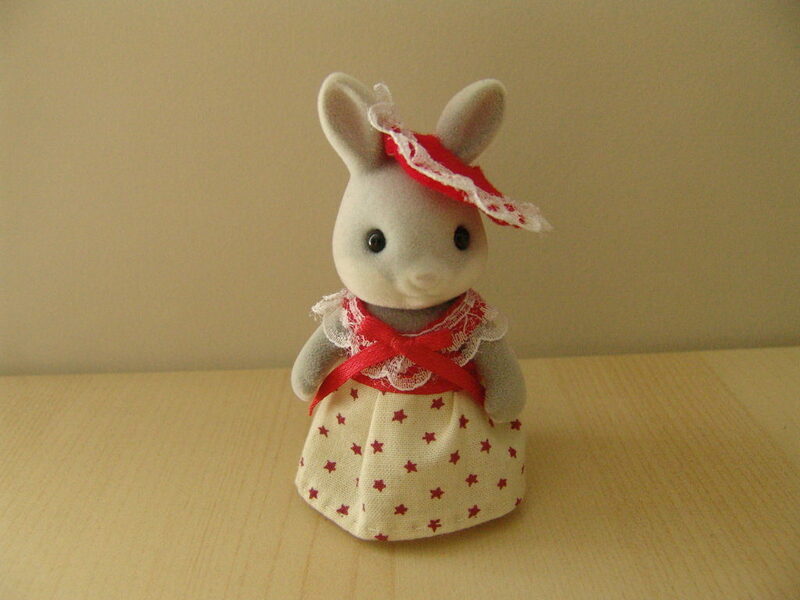 This dress will definitely be worn by one of the sylvanian ladies next year at Christmas time!